anglers, paddlers, outfitters, orca activists and business owners rally for the removal of four dams on the lower Snake River. "People are coming from California, Oregon, Idaho, Washington, and the San Juan Islands," said Sam Mace, the Inland Northwest Director for Save Our Wild Salmon. "It'll be the biggest gathering of various salmon and orca experts and constituencies that care about the Snake River in more than a decade." For more than a decade, environmental advocates have pushed to get the four lower Snake River dams removed, which would help salmon more easily navigate the river to get to their original spawning grounds. This year, only 45 sockeye salmon survived the 900-mile journey from the ocean to Redfish Lake, due to elevated water temperatures in the river. A news release on the event, called Free the Snake Flotilla, partially blames the dams for the hotter temperatures. When water just sits still instead of moving in a current, it heats up significantly faster. "The four high-cost, low-value dams on the lower Snake River stand between salmon and their home rivers--and it's time they came down," the release said. "These aging dams are costing taxpayers millions of dollars to maintain, while their benefits to the Northwest are in steep decline." 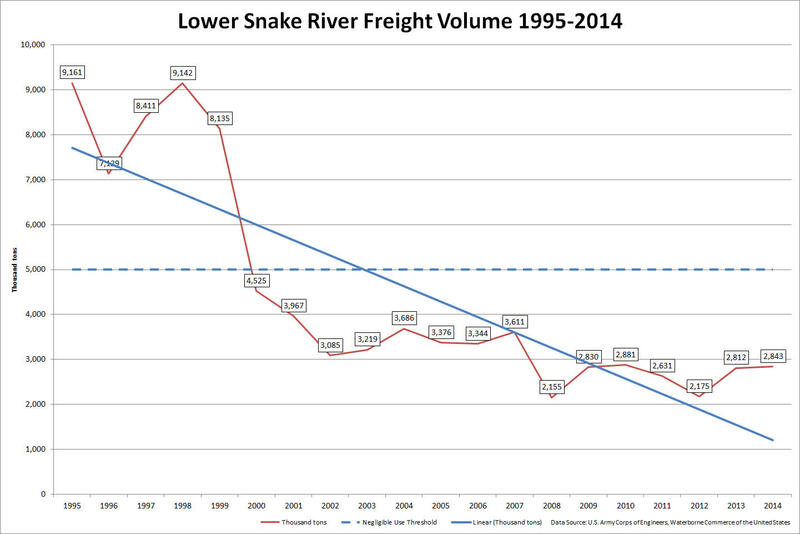 According to a report by Linwood Laughy, a north-central Idaho author and environmental activist who successfully challenged the mega-loads, freight barges on the lower Snake has declined over the past 15 years. In 1998, 17,611 20-foot equivalent units (box-car containers) went through the Port of Lewiston. In 2014, only 3,240 passed through--down 70 percent. Products like lumber and paper have mostly switched to transportation via railroad and petroleum products now run through a pipeline. Most barges now carry bulk grain. Despite the decrease in barge traffic on the river, the Army Corps of Engineers still has to spend millions of dollars every year to keep the locks and dams maintained, according to the report. There are also arguments emerging that show hydropower produced on the Snake River dams is neither cheap, nor clean. The Scientific American reported man-made reservoirs put off more than 20 percent of all methane--a greenhouse gas 35 times more potent than carbon dioxide. EcoWatch reported that researchers found large reservoirs emit as much as 104 teragrams of methane each year, compared to the 80-120 teragrams from fossil fuels. All this methane comes from bacteria on the surface of the water feeding on carbon-based organic plant material like algae. Even orca activists are jumping on the flotilla to show their support. Orcas feed on salmon, so if salmon aren't successfully navigating the rivers to the ocean because they're being held up by dams, then the orcas' food source takes a hit. "People want to do something more than write a letter to their lawmaker, though that is important," Mace said. "They want to come together, meet each other and be inspired. I'm excited to have all these folks who have been active on the Snake River issue, but have never actually seen the river, come experience it." The rally begins at 10 a.m. at the Wawawai Landing, near Pullman, Wash. Folks can paddle six miles around the reservoir, then convene again in the evening for a list of speakers and live music at the Belltower (125 SE Spring Street) in Pullman. Patagonia Clothing and Gear will send a film crew to document the events. "The float takes place on the reservoir, so we can paddle down and paddle back," Mace said. "Maybe one day, we'll need a shuttle."